1. This charging cable directly plugs into your car stock OBD2 port with switch button to master kill the charger power. 2. Provide an dedicate car dvr/gps/phone micro usb charger and save one car cigarette lighter charger for another use. 3. Smooth and Non destructive installation. Very easy to DIY. Overcurrent protection, Short-circuit protection, Waterproof. 4. DC 12-24V Wide Range Input, output: DC 5V, 1.5A. Universal for all vehicles (Car Truck Boat Ferry etc..). Cable length: 11.5FT. Troubleshooting Steps: 1. Check the voltage input, see if it is 12-24v. 2. Check the target device input specification, see if it has empty load protection (If so it won't charge over 5.5-5.8v) 3. Check the target device input power, this charger max input power is 7.5W. If your device is higher than this, then it is not compatible. This charging cable directly plugs into your car stock OBD2 port. Charge devices with micro usb socket. With switch button to master kill the power. Provide an dedicate car dvr/gps/phone micro usb charger and save one car cigarette lighter charger for another use. Smooth and Non destructive installation. Very easy to DIY. Overcurrent protection, Short-circuit protection, Waterproof. DC 12-24V Wide Range Input, output: DC 5V, 1.5A. Universal for all vehicles (Car Truck Boat Ferry etc..). Cable length: 11.5FT. Quickly charge your GPS tablet, Smart phone, DVR, Camcorder E-dog etc. 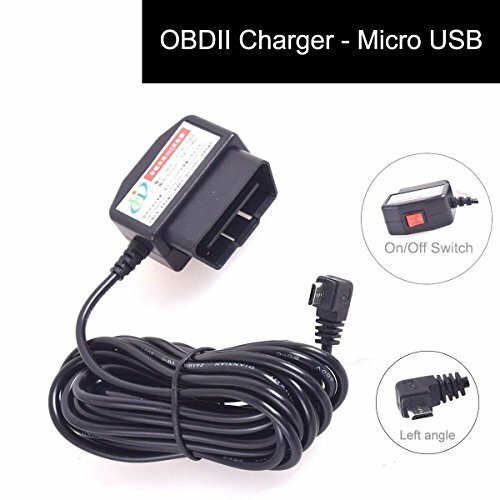 For more hard-wired direct chargers, please search ASIN code: B01EFUHK08, B017PWWA9O. NOTE: IT IS ONLY A CHARGER, NO OBD FUNCTION.